In this tutorial, we'll explore each type of hyperlink. We'll also look at how to change the color of hyperlinked text. Go to the Insert tab, and click Hyperlink. If you're adding a hyperlink to text, you can also right-click the text and choose Hyperlink. Text to display: For text hyperlinks, this field will already be populated with the text you selected, but you can change it here if you'd like. For hyperlinks on other items (pictures, shapes, characters, etc. ), this field will be grayed out. Address: Enter the full URL of the web page for your hyperlink. If you want to make sure your link works properly, click the Test button. It'll launch the URL in your default browser. Note: For non-public links, learners will need to have the necessary security permissions to access the content. Window: Choose where you want the web page to display, either Display in new browser window or Display in current browser window. 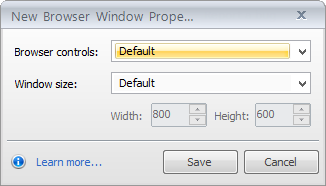 If you decide to open the web page in a new window (which is the default option), you can also customize the controls and size for the new window. Just click Default browser controls at default size, and choose your settings. The best option for hyperlinking to a file is to upload the file to a web server. Then link to its URL using the method above. Another option is to place a copy of the file in your published output. It involves a little more work than the method above, but there may be times when it's useful. When the Publish Successful dialog appears, click the Open Folder button. 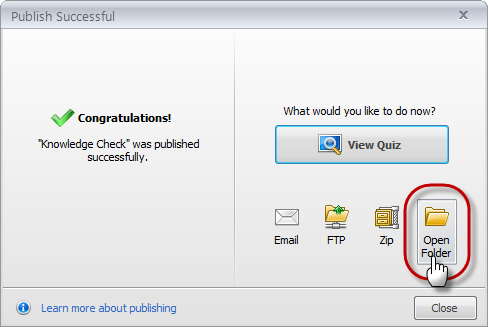 When the folder containing your published quiz opens, place a copy of the hyperlinked file into it. 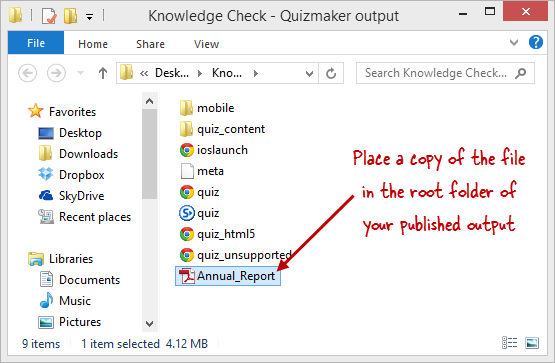 Any files that you hyperlink in this manner must be placed in the root folder of your published output (the same folder that contains the quiz.html file). If you republish your quiz, you'll need to place a copy of the file into your published output again. We recommend not using spaces in the file name. Some browsers do not work well with spaces. Use underscores or hyphens instead. Depending on the type of file and learners' security settings, the file may simply open when clicked, or learners may be prompted to save it first. Window: This option will be grayed out for mailto links. Multiple email addresses: Separate multiple email addresses with commas (but no spaces). Subject line: To add a subject line, type ?subject= immediately after the email address followed by the text of the subject line. Do not use spaces. Replace spaces with %20. Body text: To add default text to the body of the email, type &body= immediately after the subject line followed by the body text you want to use. Do not use spaces or line breaks. Replace spaces with %20. Replace line breaks with %0D%0A. When you apply a hyperlink to text, the text color changes and an underline appears. Also, when learners hover over the hyperlink in your published quiz, a text highlight appears in a color that matches the hyperlink color. In Slide View, go to the Design tab and click Colors. The theme colors you're currently using will be marked by a thin orange outline. 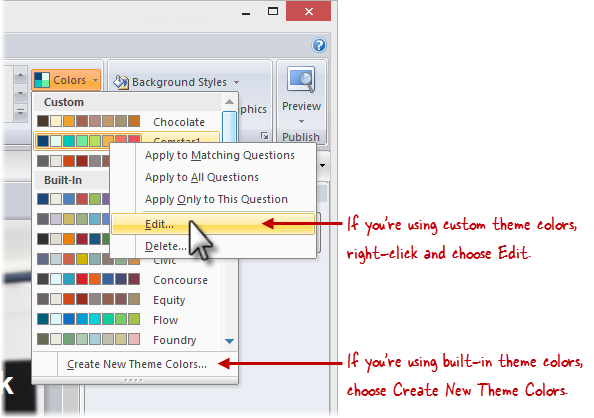 If you're using a Custom theme, right-click it and choose Edit. If you're using a Built-In theme, choose Create New Theme Colors (since the built-in colors can't be edited). 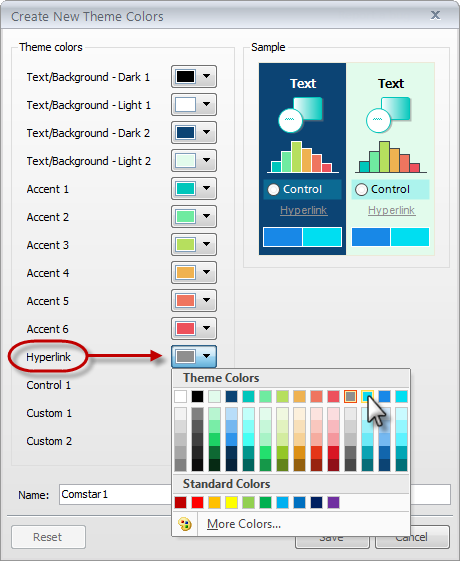 When the color editor opens, change the Hyperlink color to the color of your choice. To learn more about editing theme colors, see this tutorial. If you're creating a new set of theme colors, enter a Name for the new theme. Click Save to return to your quiz. Right-click and select Edit Hyperlink. When the Edit Hyperlink window appears, modify any of the settings, then click Save. Or, to remove the hyperlink altogether, click Remove Link. When previewing your quiz, you may find that hyperlinks don't work as expected. To properly test hyperlinks, you'll need to publish your quiz, and test the hyperlinks in your published output.